Having someone point you in the direction of a great lender can be an major relief. If you know someone who is ready for a new home loan or refinance, then be a good friend and give them Tony’s name. Not convinced? 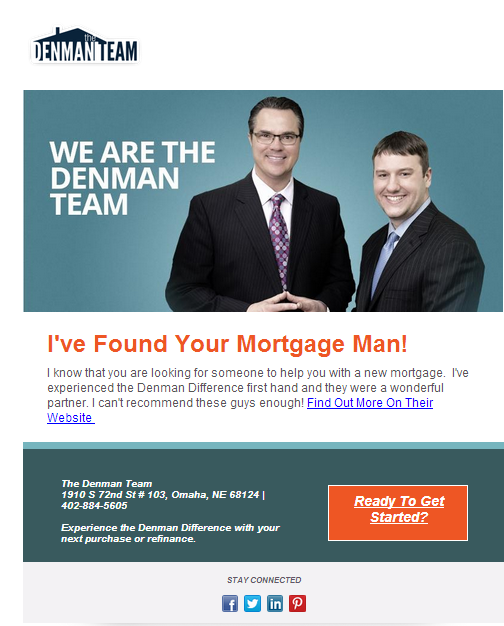 Here are three stellar reasons to refer the Denman Team. 1. Bragging Rights – The Denman Team has time and again earned Regent Financial Group’s highest honors and it’s because they are simply the best. When you refer a friend or family member to the Denman Team, your referral will get a superior experience that will make them grateful for years to come. 2. You’re Supporting Charity -Tony Denman is an active philanthropist who created the group the 12 Disciples. When you help Tony’s network grow, you help his charity efforts grow, as well. That means more food donations, more coat drives, more hours served, and a better Omaha. 3. Even Those Who Have Been Turned Down Can Find Help With Tony: Tony and the Denman Team have proprietary software that helps them develop a path for those who have been denied. When you refer a person with less than stellar credit to Tony, you know your friend isn’t going to be ignored or brushed off. ← Video: Can The Denman Team Help If I’ve Been Turned Down Before?